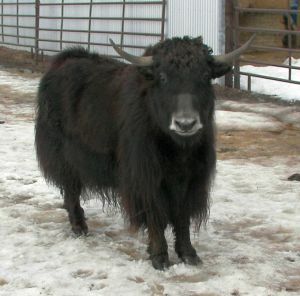 Black Yak: A pure black yak with a Grey Nose (seen at right or above). Imperial Yak: A pure black yak with a Black nose. Trim Yak: A yak that is mostly black that has a touch of white on the forehead, feet, and/or tip of the tail. 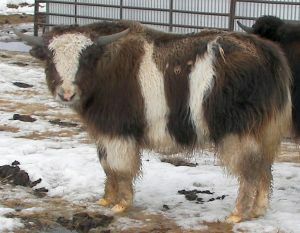 Royal Yak: A yak that is a mix of white and black or white and gold. The white normally starts from the back end and makes it way forward. Golden Yak: A yak that has a golden, honey brown color. Very rare, as the gene that creates this color is recessive. How does this effect the value? Black and Black Trim Yaks are your most common yaks in the United States. There are more of these than any other color out there. Because of this, they are normally used for meat and have a lower price range. value for being a pet and show animal. But if you really want a shining diamond for shows, Royal Yaks are the way to go. Because of their unique coloring, Royal Yaks are your most common pet and show animal. Both Imperial and Black Royal Yaks are in the medium price range. Golden Yaks are your most unique and rare Yaks. 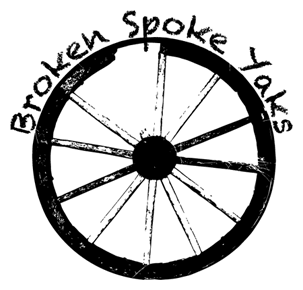 Here at Broken Spoke Yaks we were fortunate to have a golden born this spring. Take a look at this handsome fellow on the left or below. Our yak herd has the golden gene in our foundation stock.